The Allen diesel engine is one of four originally installed at Kew Bridge. The engines were installed to meet extra demand during the summer months and, along with electrical pumps, to replace the steam engines when they retired during the 1940s. 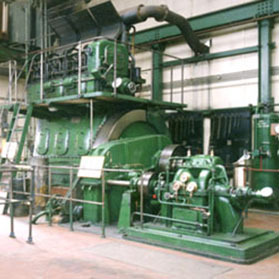 Our engine is a three cylinder, 4-stroke engine, coupled to a centrifugal pump. It has many feaures in common with more modern diesel engines, including a fully enclosed crankcase, but still has an external flywheel.